Gilbert Perreault suits up for the 2001 Hockey Hall of Fame Game in Toronto during Induction Weekend. (December 2, 2003) -- When Gilbert Perreault retired in November 1986, he had collected enough goals, assists and points to lead the Buffalo Sabres in every offensive category - 512 goals and 814 assists for 1,326 points in 1,191 regular season games. But Perreault led something else as well - he led an expansion franchise from darkness to legitimacy in a very short period of time. Gilbert Perreault was born in Victoriaville, Quebec on November 13, 1950, and developed his hockey skills on the streets around his home. "Every day, we played road hockey on Campagna Street in Victoriaville. You can learn a lot of little tricks playing with a tennis ball on the road," Perreault recalls. "I started in minor hockey (in Victoriaville) when I was six or seven years old. I was playing peewee - we didn't have anything lower than peewee. I was playing with better hockey players than I was at the time -- that's why I developed some skill in the game." It was obvious early on that Perreault's talent level was a notch above most players his age. "It started to go well when I was about nine years old. That was the first year we went to the PeeWee tournament in Quebec City. I went to that tournament for three years. I knew it was very important because we were picking up some players from the region. We were going pretty good until we met the teams from Toronto and Montreal. Their population was bigger than ours and they had better players," remembers Gilbert. "I was a Montreal fan," admits Perreault. "The Canadiens were our main team in the NHL. They had so many great players. I admired Jean Beliveau. I watched him a lot. I liked his style, I liked the way he moved and I liked his stickhandling. But I also admired Dickie Moore and Gordie Howe. They were two of the really good stickhandlers too." Gilbert advanced rapidly, and left home at sixteen to join his first junior team. "The first year I played junior was for Thetford Mines in the Quebec Junior A League. It was the last year of that league. I was in Thetford Mines with Rick Kehoe and Marc Tardif and we had a really young team, but after Christmas, we developed very well and we won everything that year in the Quebec League." 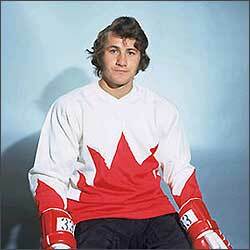 Twenty-one-year old Gilbert Perreault poses for the cameras during the 1972 Summit Series training camp, a tournament in which he recorded two points in two games for the victorious Canadian squad. The next year (1967-68), Perreault joined the Montreal Junior Canadiens for the first of his three seasons there. The Junior Canadiens played in the Ontario Hockey Association at the time. "We had such a great team for two or three years over there," smiles Perreault. "The fans were just great. We had 12 to 14,000 each game. The second year, we'd get 16,000 and the third year 17 or 18,000. We had a very exciting team and very good control of the league." Gilbert collected better than a point per game in his first season with the Junior Habs on their way to a second place finish. But it was in the second season that Perreault and the team really shone. With a lineup that included Rejean Houle, Andre Dupont, Jocelyn Guevremont, Richard Martin and Perreault, the Junior Canadiens soared. Perreault tallied 37 goals and 97 points, second on the team to Houle who collected 108 points. The team finished first in the OHA, then proceeded to the Memorial Cup finals where they defeated the Regina Pats to take the junior championship. It was Montreal's first Memorial Cup win since 1950. In Perreault's third season of junior, he earned his second straight berth on the OHA's First All-Star Team, leading Montreal with 51 goals and 70 assists for 121 points, second to Marcel Dionne's 132 points with the St Catharines Black Hawks. "Toronto had a great team too," says Perreault, recalling a team that included Dale Tallon, Steve Shutt and Steve Vickers among others. "It was a good match-up there." But the Canadiens prevailed against Weyburn's Red Wings to win a second consecutive Memorial Cup. The 1939 and 1940 Oshawa Generals and the 1955 and 1956 Toronto Marlboros were the only two junior teams to win back-to-back championships prior to the Junior Canadiens. Gilbert Perreault won the Most Valuable Player award in 1970, and after two Memorial Cup championships, NHL teams hotly contested his services. Two new teams were being admitted to the NHL that season - the Vancouver Canucks and the Buffalo Sabres. The first choice in the 1970 Entry Draft was determined by the spin of a giant roulette wheel. Punch Imlach, Buffalo's general manager, won the coin flip and chose the Number 11, his favoured number. NHL president Clarence Campbell spun the wheel and announced it had stopped on the Number 1. The Vancouver Canucks executives began celebrating until Imlach took a closer look and noticed that the wheel was actually stopped on '11,' not 1.' 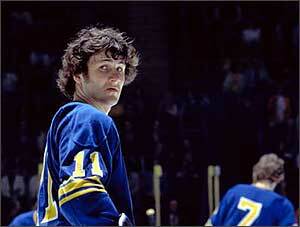 Gilbert Perreault was quickly selected as the Buffalo Sabres' first player and wore the Number 11 throughout his pro career. 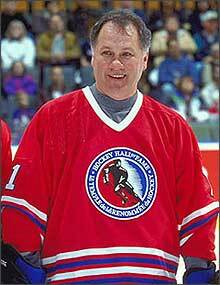 With the second choice, the Canucks settled for Dale Tallon. The Sabres built their franchise around the young Victoriaville star. Perreault paid immediate dividends for Buffalo. In his first season, Gilbert scored 38 goals and added 34 assists for 72 points and was named the NHL's Calder Trophy winner as rookie of the year. Although Buffalo didn't make the playoffs, there was enough excitement and promise to suggest that the team was a franchise that could compete for years to come. In fact, with the selection of Richard Martin, Gilbert's Junior Canadiens' teammate, with their first selection in the 1971 Entry Draft, Buffalo had a nucleus that made them one of the stronger franchises through the 1970s. "In my first seasons, Imlach told me to go for goals and not worry about checking. That really helped me get my confidence," admits Gilbert. "The first few years I was there, it was loose. I was rushing the puck a lot. We had style." "He (Punch Imlach) showed me video tapes of me in games to prove I was shifting one way too much," remembers Perreault. "He got me to shoot faster; not to nurse the puck for careful aiming. He also wanted me to shoot more and to cut down on what he called 'walking in' on the goalie, something I developed on finding my slapshot wasn't hard enough." One of the most explosive lines in NHL history, 'The French Connection,' was formed in the spring of 1972 when Rene Robert was acquired in a trade with the Pittsburgh Penguins that sent popular Eddie Shack in the other direction. Robert was placed with the tandem of Martin and Perreault and clicked instantly. In 1972-73, the three finished one-two-three in scoring for the Sabres, and Buffalo made the playoffs for the first time in the franchise's existence. The next season, with Perreault injured for twenty-three games, the Sabres staggered and missed the playoffs again, but in 1974-75, Buffalo made a Cinderella run towards the Stanley Cup. 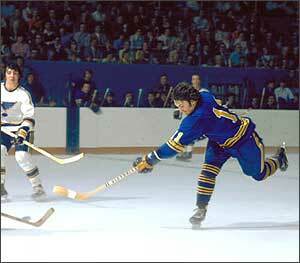 Buffalo faced the Philadelphia Flyers for the Stanley Cup in the spring of 1975. Game Three on May 20, 1975 was one that will be long remembered. That game came to be known for the fog that shrouded Buffalo's Memorial Auditorium. The arena was not air-conditioned and the temperature outside reached 90 degrees. Temperatures at ice level also reached 90 degrees. With the humidity, the heat and the presence of over 16,000 screaming fans, it produced a blanket of fog over the ice surface. The Flyers won the first two games of that final series in Philadelphia. With the French Connection swarming around Flyer netminder, Bernie Parent, Bill Hajt banged in the rebound from a Richard Martin shot to send the game into overtime. The fog settled on the ice for the extra session and the play had to be stopped seven times during the first overtime because the players couldn't see but inches in front of them. The players on both teams skated around in an unsuccessful attempt to clear the fog. Auditorium workers had to come out waving bedsheets to try to eliminate the low-hanging fog. Some of the fog dissipated so play resumed, only to be halted again and again because visibility was so poor. The coaches for both teams, Fred Shero of the Flyers and Floyd Smith of the Sabres, instructed their players to shoot the puck any time they got it because the goaltenders would have trouble seeing it. With a minute left to play in the first overtime, Richard Martin picked the puck up along the boards and passed it to Perreault, who skated into the Flyer zone and then passed it to Rene Robert in the far corner. "Rene yelled to me and I saw him going to the corner," says Perreault. "I was in the middle, about five feet over the red line. I passed to the boards in the corner." Robert got in front of the Flyer defenseman and retrieved the pass right before the goal line. "It's almost impossible to score from that angle," Rene Robert related. "But I shot at the net, hoping somebody could get the rebound. It seemed to me he (Bernie Parent) wasn't ready for the shot. It went between his legs." "I didn't see Perreault's pass," Parent said afterwards. "I saw Robert's shot too late for me to come out and stop it. I'm surprised the overtime took so long. It was hard to see the puck from the red line. If three men came down and one made a good pass from the red line, you couldn't see the puck. A good shot from the red line could have won it." Although the Sabres took Game 3, the Flyers went on to capture the Stanley Cup four games to two. It was as close as Gilbert Perreault would ever get to winning the Stanley Cup. The fans in Buffalo had enormous expectations for the sensational French Connection. Although the line delivered regularly, Gilbert was well aware of what was expected of him. "You have to feel the pressure to play good. If you don't have the pressure, you can't be at the top of your game. It's part of the game," acknowledged Gilbert. "Today, I feel a lot of pressure because I have two kids -- that's pressure! Life is pressure. You need that to perform. Without pressure, you cannot perform." Yet, in spite of the pressure ladled onto the star centre, Perreault remained modest and shy - a trait that occasionally was translated incorrectly as aloofness. Perreault offers, "It's not easy being number one. You live with it every day. They pay you to perform. You face the public all the time. Sure there's a lot of pressure." In 1975, he added, "I just play hockey and I'm not very good at talking about it. I like other things - relaxing with my wife, a little golf, listening to music, going to the movies, but mostly, I just like to play hockey." Gilbert Perreault spent his entire seventeen-year career with the Buffalo Sabres, dazzling fans with his blazing speed and scintillating moves. But on November 24, 1986, he called it quits. "It was a tough decision to make but there's a time for everything and today is the day for this," he said in a press conference at the time. "Mostly, it was a case that I had just had enough. You need a certain feeling; a special eagerness to want to practice and want to play the game. I had lost that." Perreault retired at the top of every single offensive category in the history of the Sabres' franchise; records that he still retains today. During his NHL career, Gilbert was named to the Second All-Star Team twice (1976 and 1977), was the rookie of the year in 1971 and was awarded the Lady Byng Trophy as the league's most gentlemanly player in 1973. One of the few awards that eluded Gilbert was winning the Stanley Cup. "I have a lot of regrets about that. We only went to the finals once in 1975 and didn't win. So if you don't get to the final playoff games, then you don't have a chance." But Perreault was rewarded in other ways. In 1990, his Number 11 was retired by the Sabres' organization. That same year, he was elected to join the Honoured Members in the Hockey Hall of Fame. "I didn't enjoy attention when I played but the Hall of Fame is different. It's the greatest honour a player can have," beams Perreault. "Having a chance to play for the same team for seventeen years was a highlight. In my first year, I set a record in the NHL for scoring 38 goals. That was a highlight. Scoring 500 goals was a highlight," reflects the Hall of Fame centre. "I had a lot of fun. Hockey has to be fun to be good. If the sport isn't enjoyable then you can't be successful." Gilbert Perreault enjoyed the game, and the game of hockey certainly enjoyed being graced by Gilbert Perreault.